Image: The Große Halle (Big Hall), the biggest chamber of the Laichingen Vertical Cave, Germany. The forming of karst caves is very complicated and it is still a topic of geological research. But some basic aspects are very simple: water containing carbon dioxide CO2 is able to dissolve limestone. This happens on the rock surface, just at the border between rock and soil. But when the limestone, which is originally water proof, contains cracks produced by tectonic forces - which is very common - the water oozes into the rock and starts to widen the cracks and solute caves inside the layers. The limestone in the spring water in karst areas is very common and well known to the people living in those areas. If you heat this water (e.g. for making coffee, in the washing machine,...) the CO2 escapes and the limestone gets solid again. This process is similar to the forming of many speleothems in caves, like drip stones. 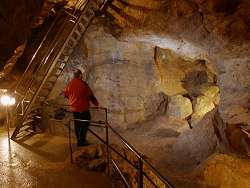 You can read more about: limestone caves (and non-limestone caves). Or you may go to the Speleothems section. Search Google for "Karst Cave"